Part of the landscaping process is to assess the type and condition of the soil. This way, contractors will have an idea on which type of land grading and preparation methods are needed before installing softscape and hardscape. Certain issues should also be considered, like soil erosion and flooding. These problems when neglected can result in more problems for the property owners. If your landscape is prone to these problems, let Four Seasons Landscape Management provide efficient solutions, particularly in erosion control. One of the most common erosion control methods for landscapes is the use of plants. The installation of ground covers, such as grass or mulch mats, not only helps hold the soil in place but also enhances the overall appeal of your outdoor area. For steeper slopes, putting trees or shrubs can provide better protection against soil erosion. The roots of plants serve as a brace, holding the soil together. Also, the roots absorb any excess water to prevent flooding in a landscaped area. Some landscapes are prone to more dangerous and frequent soil erosion. For steep slopes and very loose soil, structures may need to be built for effective erosion control. One example is terracing. 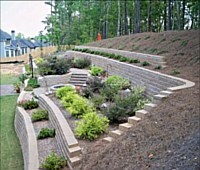 Terracing is a method wherein a slope is transformed into a stair-like structure with the use of retaining walls. The structures allow water to soak in on descending flat surfaces instead of run off. These will require the use of strong and durable materials, such as stone, concrete blocks, or bricks. Another method of controlling the occurrence of erosion is by laying down nets on soil to hold saw dust, mulch, or other ground covers in place. The net also provides additional protection during heavy rainfall. 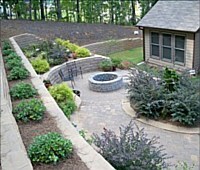 An additional method for erosion control is by flattening the whole outdoor area. This way, the excess water or strong wind will not drag and displace soil. If you have any idea or preference on controlling erosion, we would be more than happy to discuss it with you and incorporate it into your landscape design. To know more about erosion control methods and the various options we offer, contact us at your most convenient time. We have already completed several projects in Newnan and in other areas in the state of Georgia, so you are assured that you will be hiring an experienced contractor.